We Orthodox live Christ in the Divine Liturgy, or rather Christ lives within us during the duration of the Divine Liturgy. The Divine Liturgy is the work of God. We say: "It is time for the Lord to act." Among other things, this means that now is the time for the Lord to act. Christ liturgizes, and we live with Christ. Christ celebrated the Divine Liturgy once and this passed into eternity. His divinized human nature came to the Divine Liturgy. We know Christ specifically in the Divine Liturgy. The Divine Liturgy we celebrate is the same Divine Liturgy which was done by Christ on Great Thursday in the Mystical Supper. After the Divine Liturgy we must continue to iconify the Kingdom of God, keeping His commandments. The glory of Christ is to bear His fruit in every member. This explains His word: "Herein is my Father glorified, that ye bear much fruit" (John 15:8). The Divine Liturgy took place once and forever. It has eternality. Every time the Divine Liturgy is performed, we ascend to its height. If we experience some aspects of the Divine Liturgy, then we will understand its grandeur, as happened with Saint Seraphim of Sarov who saw angels entering the church during the Small Entrance. We follow the Divine Liturgy because we do not experience it, or until we do experience it. When one observes the commandments of Christ, they are not just doing obedience, but they become united with Christ and acquire the mind of Christ. 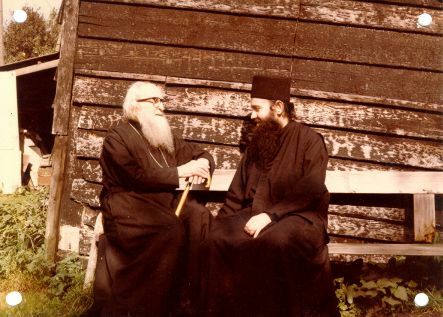 Source: I Knew A Man In Christ: The Life and Conduct of Elder Sophrony, the Hesychast and Theologian (Οίδα άνθρωπον εν Χριστώ: Βίος και πολιτεία του Γέροντος Σωφρονίου του ησυχαστού και θεολόγου) by Metropolitan Hierotheos of Nafpaktos and Agiou Vlasiou. Translation by John Sanidopoulos.